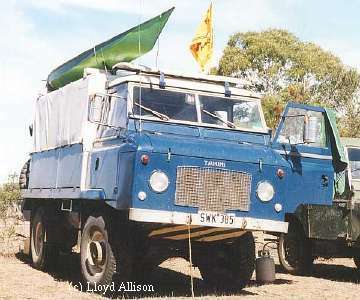 1962: A forward control, or cab-over, version of the SIIA Land-Rover was introduced with much greater load area. Unfortunately the (cheap) design was heavy, if strong, and the vehicle was under-powered. Underneath the forward control is a standard Land-Rover SIIA chassis. A new sub-frame is bolted to the front of the chassis to carry the cab. The cab shares some panels from SIIAs. The radiator is moved forward and the radiator fan is driven by a small propeller shaft, although this is often "lost" later in life, particularly with engine conversions when electric fans may be fitted. An arrangement of longitudinal girders and uprights bolted to the SIIA chassis supports a drop-side tray in the basic vehicle. The engine cover intrudes slightly into the tray bed. Some vehicles are fitted with a centrally-mounted PTO-driven winch from which the cable can be run out to the front or rear through pulleys. 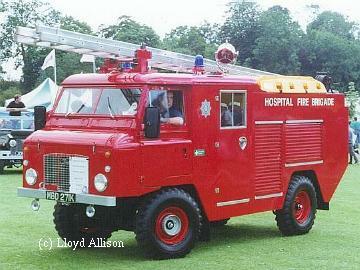 1966: An improved `Series IIB' forward control was introduced. This had much stronger (and now very rare) `ENV' differentials. The track was widened slightly for stability, and the wheelbase was lengthened to 110" (- good for trivial pursuits) by moving the front axle forward by one inch. The most obvious identifying features are the lower position of the head-lights, and the large and uniquely shaped differential cases.